Imagine transforming your world into something more exquisite, tasteful, enchanting... alive. 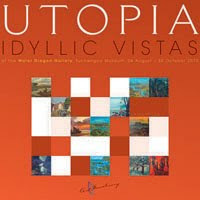 Renowned Filipino artists Fernando Amorsolo, Felix Resurreccion Hidalgo, Prudencio Lamarroza, Vicente Manansala, Hernando Ocampo and Juvenal Sanso brings to life an exploratory tour of a world defined by the imaginary at Utopia: Idyllic Vistas by the Art Sanctuary. Revel into distant places today. The exhibit is open at Yuchengco Museum, RCBC Plaza, from August 6 to October 30, 2010. For invitations and events, please send email to here.